Will the Stock Market Crash Today After the Fed Rate Hike? Subject: Will the Stock Market Crash Today After the Fed Rate Hike? The Fed's decision to raise interest rates has investors worrying about a potential stock market crash today. Major U.S. stock indexes have been surging to record highs recently. The Dow continues to flirt with the 20,000 level as it closed at a record high for the last six days in a row. The Dow set an all-time high on Tuesday (Dec. 13), peaking at 19,951.55. Both the Nasdaq and the S&P 500 set a new record on Tuesday, too. The S&P 500 was on its fifth day in a row of setting a new intraday high. Normally these are great numbers, but they're raising red flags with traders. Stock markets breaking record highs so easily could be a sign of a stock market bubble. "There was little economic rationale for the rally," said Michael Lewitt, Money Morning's Global Credit Strategist. "This rally has many earmarks of a blow-off driven by emotion rather than economic fundamentals." Now, the Fed rate hike comes in the middle of this historic market rally, which isn't being driven by economic fundamentals. That has some traders nervous the decision will lead to a stock market crash today. The Fed announced today it will raise interest rates by 0.25%. The decision was widely expected – the CME FedWatch Tool gave it a 95.4% probability. But higher interest rates could still cause money to leave the market. 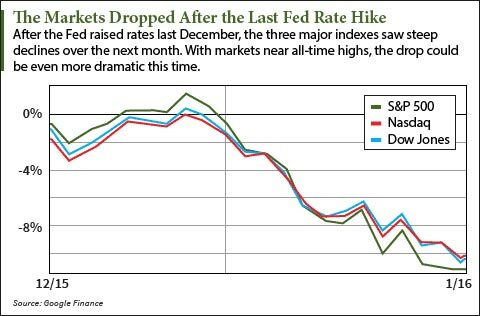 Last December, the Fed raised interest rates by 0.25%, and the markets saw steep declines through January, as the chart below shows. This time, markets are at even higher levels. And if soaring markets aren't being driven by economic fundamentals, they could be even more susceptible to a market correction. The Fed has only raised interest rates once since they fell below 1% in 2008. Today's announcement from the Fed indicated it will be planning on three more rate hikes in 2017. Investors need to be prepared for a market correction.